North Korea’s leader Kim Jong-un on Tuesday urged South Korea to “completely halt” military exercises with the United States, a move that analysts see as a way of increasing pressure on Seoul and Washington to make reciprocal gestures in response to the North’s moratorium on nuclear and missile tests. In his New Year’s address, Kim demanded that the South Korean government stop holding combined military drills and accepting US strategic assets, describing these actions as sources of tension on the Korean Peninsula. “Now that the two Koreas (are) on the path (to) peace and prosperity, we insist that joint military exercises with outside forces should no longer be allowed and deployment of war weapons such as outside strategic assets should be completely stopped,” Kim said. 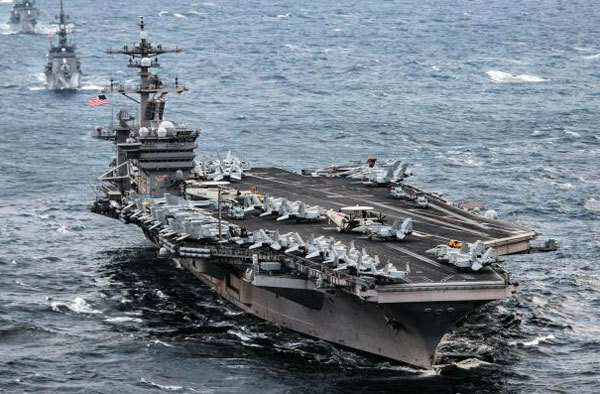 USS nuclear-powered aircraft carrier Carl Vinson. US Pacific Command. His remarks appear to contradict earlier, more conciliatory, comments that the Moon Jae-in administration said the North Korean leader had made during his meeting with President Moon Jae-in’s top security aide. After meeting with Kim Jong-un in Pyongyang in March, national security adviser Chung Eui-young told reporters in Washington that Kim had expressed his understanding of the need for the South Korea-US joint military drills. Nevertheless, the North’s propaganda media outlets have recently ramped up their calls for a complete halt to the military drills. “If we continue to see war rehearsals held under the title of either ‘annual drills’ or ‘reorganized exercises,’ when are we going to create a peaceful environment on the Korean Peninsula?” the North’s propaganda outlet Maeari asked last month. Kim’s shift in tone reflects an intention to step up pressure on Seoul and Washington amid stalled denuclearization talks, analysts said. Pyongyang expects the allies to reciprocate his nuclear moratorium with significant rewards, and the permanent suspension of military drills would serve that purpose, they added. While South Korea and the US have suspended a series of military exercises since the summit between Kim and Trump in April, the allies have hinted that such decisions depend on the outcome of diplomatic engagement with North Korea. “North Korea is saying the allies’ decision to halt joint military exercises has to be permanent, rather than temporary, in exchange for a more permanent halt to their nuclear and missile tests, vice-versa,” said Kim Dong-yub, a professor at Kyungnam University. While the US and South Korea have yet to determine the detailed schedule of this year’s combined military exercises, speculation is rampant that the allies will scale down the scope of their military drills. The US has reportedly suspended its deployment of strategic assets, such as bombers, to the Korean Peninsula since November in 2017. Bomber drills are said to have taken place outside the Peninsula for about a year.